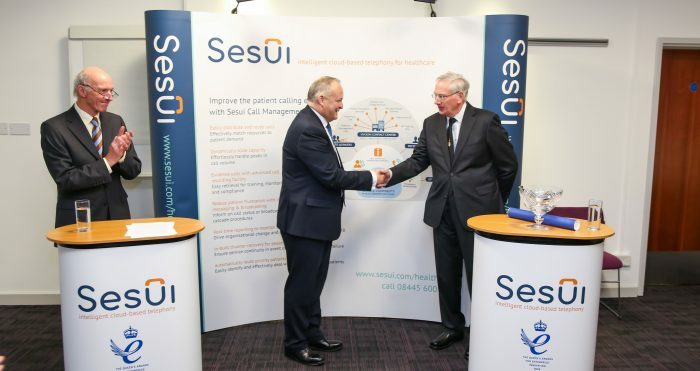 Sesui, the cloud-based telephony and contact centre innovator based in The Magdalen Centre, has been presented the 2016 Queen’s Award for Enterprise by HRH The Duke of Gloucester at a ceremony held at The Oxford Science Park on Tuesday 15 November 2016. Employees and customers of Sesui were joined by dignitaries to celebrate strides made by the business in cloud telephony innovation, and to see Lee Bryant, Managing Director of Sesui, accept the official grant of appointment and commemorative glass bowl. The event follows the Royal Reception for winners, which was hosted at Buckingham Palace by Her Majesty The Queen in July. One of only three Oxford-based businesses to receive the Queen’s Award for Enterprise within the Innovation category, Sesui was first announced a winner of the award in April, on account of its wholly owned and developed telephony platform, the i-Platform, which underpins all of its cloud-based telephony solutions. Cloud-first strategies in general are fast being adopted across all business operations to enhance customer interaction and drive operational productivity, and cloud telephony is no exception. The Sesui i-Platform, however, delivers the added flexibility to exploit full-scale contact centre functionality for companies of all sizes in a matter of weeks, and solutions can overlay onto any existing type of telephony infrastructure with no need to rip and replace. As the trend towards flexible working grows, Sesui solutions can ensure businesses maintain visibility and connectivity with remote workers securely, and without any disruption for the customer. Data can also be recorded across multiple sites and dispersed resources, in real-time, to assist with making decisions that benefit overall business profitability. Main: from left to right: John Harwood, Vice Lord-Lieutenant of Oxfordshire; Lee Bryant, Managing Director, Sesui; HRH The Duke of Gloucester. HRH The Duke of Gloucester presents Lee Bryant, Managing Director, Sesui, with the 2016 Queen’s Award for Enterprise. Second: from left to right: Lee Bryant, Managing Director, Sesui; HRH The Duke of Gloucester; John Harwood, Vice Lord-Lieutenant of Oxfordshire. 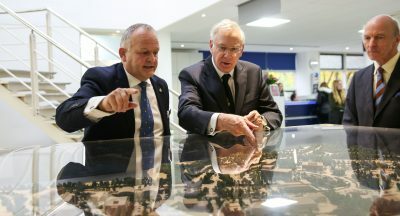 Lee Bryant, Managing Director, Sesui, discusses the benefits of cloud-based telephony with HRH The Duke of Gloucester.